Everyone always asks, "Who is Island Jack?" My name is Janet Caraker. I guess you could say that I am Island Jack! Tropical travel is my passion. 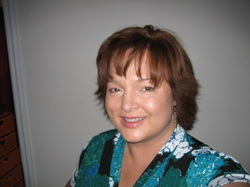 I started my career as a travel agent in 1987 at Elite Travel in Rocky Mount, North Carolina. I loved helping my clients make the most of every business trip and vacation while not breaking the bank. This a picture of me "back in the day"
Travel is my passion ... and I want to share it with you. My lifelong love of travel and people have made this the perfect profession for me. I really enjoy creating memorable vacations and getting great value for my clients! There is nothing better than showing people that they CAN afford a great vacation on a budget. Over the years, my reputation has grown. I earned my CTC (Certified Travel Counselor) designation and opened Island Jack's Travel in Greenville, NC in 2002. I have been honored to be chosen to serve on the boards of several large travel companies such as American Airlines, Travelocity and Sabre Holdings. I also contributed to the beginning of Jurni Network which evolved into Nexion, of which I am a proud member today. Locally I have participated in Rotary Club, Greenville NC Chamber of Commerce, and the Business & Professional Womens Network. In 2009 I become a Destination Wedding Specialist and now provide travel services to wedding couples and their guests. In 2015, I was nominated to be a founding member of the prestigious Preferred Travel Alliance. I have been truly blessed by the travel community. *** The next big question is "Who is Custom Vacation Designer"? Island Jack's Travel is our "Fun in the Sun" focused agency. As we have grown, our clientele has also grown and are looking for MORE for their precious vacation time. As of January 1, 2018, an additional brand, Custom Vacation Designer, launched to better reflect our current offerings that include a significant number of European tours & river cruises as well as boutique ship ocean cruising and customized European trips. Don't worry .... we are happy to still book your old favorites but always remember that we offer SO much more! All of my loyal clients cheered me on over the years and have been such a wonderful support for me. I appreciate each and every one of you! Through you I have met so many other wonderful people with your referrals. Your support and friendship mean everything to me. Thank you for choosing Island Jack's Travel!